The road to ruin is spending beyond one’s means. “You’ll be the ruination of me,” is a remark to a dependant with extravagant wants. A dead loss is useless. He’s loaded means he is rich. A loaded question is one phrased in a way which encourages a particular answer. In Latin there are different question words which have this effect – nonne and nem. Not to be sneezed at and not to be sniffed at both mean worth having. To the tune of… may introduce a price or a comedy party-piece popularised by the radio show I’m sorry I haven’t a clue – one song to the tune of another. Top of the range means the most expensive item with the most extra features compared with a basic model. A catch penny is a place or a scheme designed to make money. Salt away means save. It is an old expression handed down from days before refrigeration, when salt was a good way of preserving food. Cheap and nasty describes some inexpensive goods. Buying such items would be false economy. Pay through the nose is an idiom meaning pay more than something is worth. Feather your nest means make things comfortable for yourself, perhaps selfishly. On a shoe-string means on a low budget. Cheap at half the price means rather dear. Worth a mint is very rich describing a person or very valuable describing a thing. A mint is where money is made. Ring-fenced is a term borrowed from farming or ranching and applied to a sum of money set aside for a purpose. In the Bible there is much about money. Ecclesiastes 5:10 was written by a rich man, King Solomon and begins Whoever loves money never has money enough. Footnote: Help is available for those with debt problems from various agencies including CAP. is a saying, which people often use jocularly about themselves. Presumably a bad penny didn’t operate the locks in a public toilet! means to be able to afford something. can take a long time. It involves going from shop to shop to see where the best value for money is to be had. is an outing resulting in a lot of purchases. usually involves spending a lot of money. is the opposite of doing things by halves. has nothing to do with vampires, but more to do with betting. A shareholder has a stake in a company. reminds me of the folk song The Wraggle-Taggle Gypsies-O, which tells the story of a well-to-do young lady who ran away from her comfortable life. It means cushioned from hardship. 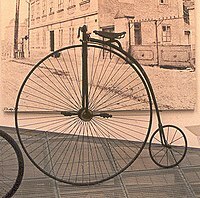 was a bicycle with one wheel bigger than the other in a similar ratio to the two coins. is an expression for meanness. is often used ironically to describe someone who doesn’t spend much. are idioms about poor people, who cannot afford new shoes or even repairs and are struggling to buy enough food. implies taking a decision which will prevent you from wasting more time or resources than you already have. This is advice about not continuing to spend on a project or cause, which is not succeeding. Money is neither good nor bad. It is how it is used that is important. She’s worth her weight in gold. refers to someone who charges a high price.